Last week on Tumblr I received a really thoughtful ask in my inbox. 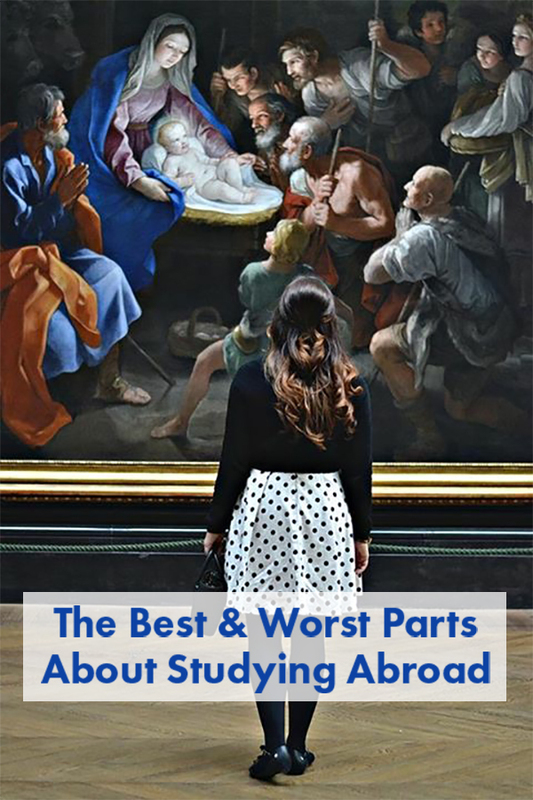 It was a simple but important question – “What's the best part and worst part about studying abroad?” People always highlight the best parts. Students abroad (myself included) post idyllic photos and talk about all of their incredible experiences eating, sightseeing, and exploring. Rarely does anyone discuss their bad days, their frustrations, or the difficulties they encounter living abroad. I think the tendency to romanticize living in Europe doesn’t prepare students for the struggles they might face living in a foreign country and culture for the first time (culture shock is real people). First, I have to admit that I am biased. I truly believe that every American student should study abroad. From my own experience and what I see with the students I work with, studying abroad changes the way you see the world and your place in it. Your worldview is no longer isolated or fixated on the U.S.; you have a much larger political and cultural context. That said, I will never forget my first freakout abroad. I was a junior in college and I had never been out of the US. We landed in Rome and I was determined to start exploring the city. I threw my bags in my room, grabbed my map, and ran out the door by myself (everyone else was too tired). I had prepped for my adventures in Rome by memorizing the placement of major sights on the map, so as soon as I got my bearings I headed straight towards the Colosseum, or so I thought. As I stood there, frozen in fear with cars and people whizzing by, I began to talk myself off the ledge. Slowly I made my way across the street and out of traffic. I told myself I had a choice, embrace the fear and the unknown and continue on to find the Colosseum or return to my hotel. Fortunately, I pushed through and eventually found the Colosseum. Within a couple weeks I was confidently guiding myself through the city and stopping traffic to cross streets. Today, whenever I enter Piazza Venezia I am reminded of that moment and it brings a little smile to my face. Study abroad isn’t all photo ops and gelato. Living and traveling in foreign cultures can be mentally and physically exhausting (just ask former students about all of the stairs and cobblestone, and blisters on their feet). You will be faced with lots of inconveniences and different ways of doing things, which you may or may not agree with. You will often find yourself frustrated by a foreign language and culture. You will also likely have to learn how to travel in a group and typically live with people you didn’t know beforehand. Furthermore, studying abroad is not a vacation, especially if you do an abbreviated summer program. Even fall and spring semester students maximize their experiences by traveling every weekend. They still have fun, don’t get me wrong, but it’s definitely not a relaxing experience. You will be tired (but in my opinion, if you’re tired, you are doing it right). Yet all of these difficulties are what makes studying abroad so important. Ultimately, it opens up the world to you. I think for most, one experience abroad, absorbing and grappling with being in another culture, makes the world/travel seem more attainable. Connected to this is the confidence you get from realizing you can live in a foreign place. You can (attempt to) learn a new language and culture, be scared, uncomfortable, confused, and overwhelmed, and make it, learning a lot about yourself in the process. This builds character, reveals who you are (for better and for worse… I have had some frustrating moments that I am not proud of), and shows you what you are capable of. Finally some advice: Research available programs thoroughly (don’t follow friends or boyfriends/girlfriends) to find the best fit for you. And pack less then you think you should and budget more! If you have studied abroad, what would tell some one was the best and worst part?